Twin Cities live sound and performance arenas. Rhaelee currently works at a local church in addition to Crooner’s Lounge & Supper Club and various live sound venues. In addition to being a live sound engineer and audio producer, Rhaelee is also a performer. She has just released her Music = Language EP on Apple Music and Spotify. 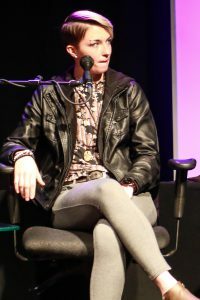 On this EP, she has collaborated with fellow IPR alumni, as well as instructors including Walter Chancellor Jr.
Rhaelee had participated in IPR’s Women in the Media Discussion Panel on November 15th, where she had discussed highlights of working in the audio industry. To view recaps and live streaming of this event, please see our Facebook post. What is the name of your business? When did you officially “open your doors”? The name of my business is Jill of All Trades. It’s an umbrella company to my second business Hub Entertainment, a staging company. I first opened the doors on May 22nd 2017. What does your company do? What is your website (if you have one)? My company specializes in sound manipulation and live or studio engineering as well as, hydraulic stage rentals for outdoor shows. I have multiple venues and production companies that I partner with across the twin cities for different events, sessions and performances. We strive to reach as far as necessary in order to give clients a safe stage setup for shows. Whether its performances, motivational speakers, or even outdoor yoga events, we will accommodate our clients needs. Both my personal music projects and HUB Entertainment can be found at Rhaeleesmusic.com. What is the biggest lesson that you’ve learned from having your own business? What has been the most rewarding aspect of having your own business? The most rewarding aspect of owning my own business, is getting to work for causes and organizations that I believe in and can get behind. Working with movers and shakers that understand, in order to be the change we want to see in the world, we should be demonstrating that change. It’s one thing to talk about issues on how this world can be a better place, but it’s another to go out and put actions behind words. What advice do you have for other IPR graduates or students who are aspiring to be self-employed? Do it. Anyone that tells you it’ll be too hard, or too time consuming, or when will you be able to go out and hangout, do you have the money for it? Don’t listen to them, do the things you aspire to do and be the passion that’s lit inside of you. Go out and find a way to get it done, and if that doesn’t work try a new tactic, many people forget that we can reach the same destination a multitude of ways.